Creative Commons licensing can be a good way for businesses and artists alike to protect their creative works while enabling productive sharing, but figuring out which of the six Creative Commons licenses is best for you can feel like a daunting challenge. I wrote a guide to the topic earlier this year, but now the Creative Commons organization itself has come out with a newly revamped tool to help users choose which license to adopt. “The license chooser has been completely redesigned for greater clarity and ease of use,” wrote Jonathan Palecek, a software engineer with the Creative Commons, in a blog post on Tuesday. There has been a chooser tool on the Creative Commons site for some time already, and it “was successful at simplifying the act of selecting a license and applying it to one’s work,” Palecek noted. However, the tool's linear workflow was too much like a registration process, he noted. Specifically, the old chooser’s interface was a form you would fill out and submit to the organization's server; in return, you'd get a page showing what license you had chosen along with other information and options for marking your work. “These additional options were tucked to the side, much like fine print, so most users ignored it,” Palecek wrote. Following numerous extensions over the years, the old chooser was also suffering from a cluttered interface, he added. Now, the new chooser combines the selection and results pages into four simple panels, as shown in the image above. 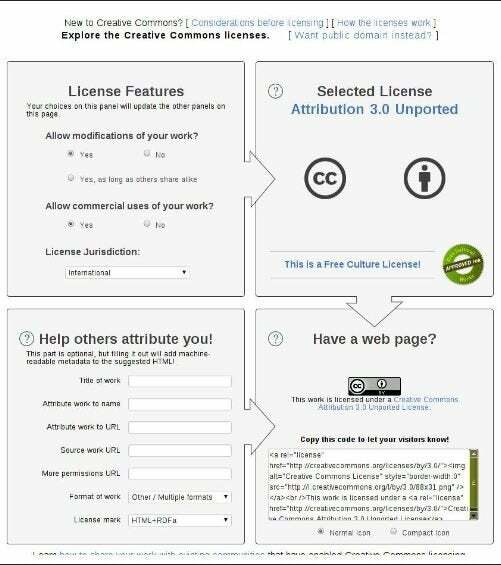 If you're considering using a Creative Commons license, this tool is worth checking out. You'll find it on the Creative Commons site.